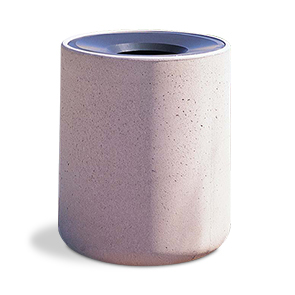 The reinforced concrete construction of this 36 Gallon Round Concrete Trash Receptacle allows it to withstand just about anything the environment can throw at it. Great for malls, museums, and various public areas where high volume waste disposal is needed. Liners are included with every option to help make trash removal quick and easy. Smooth aluminum lid design creates a funnel to help dispose of trash easily.